On Sale Now! Save 10% on the Moen YB8408BN Weymouth Pivoting Paper Holder, Brushed Nickel by Moen at Wakaf Center. MPN: YB8408BN. Hurry! Limited time offer. Offer valid only while supplies last. 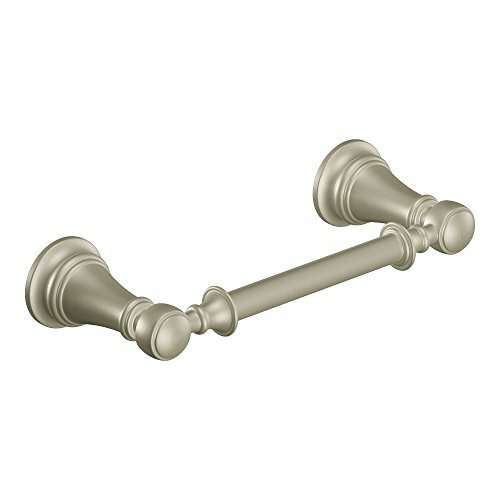 YB8408BN Finish: Brushed Nickel Features: -Pivoting paper holder. -Included template and mounting hardware take the guesswork out of installation. YB8408BN Finish: Brushed Nickel Features: -Pivoting paper holder. -Included template and mounting hardware take the guesswork out of installation. -Metal mounting post for extra security. -Corrosion resistant. Mount Type: -Wall mount. Roll Capacity: -1. Primary Material: -Metal. Dimensions: Overall Height - Top to Bottom: -1.99". Overall Width - Side to Side: -10.02". Overall Depth - Front to Back: -3.83".